Synopsis: If you have a large group of players, this drill can have all of them involved for work on serving and ball control skills. 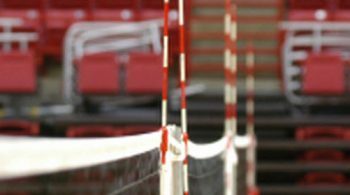 It has much in common with the Serving-Passing-Setting Quads drill. Age/Skill Level: This is a drill for all levels. Execution: Put two passers and two servers on both sides of the net, along with a setter and a target for the setter. In the initial phase the server serves to the passer across from them. 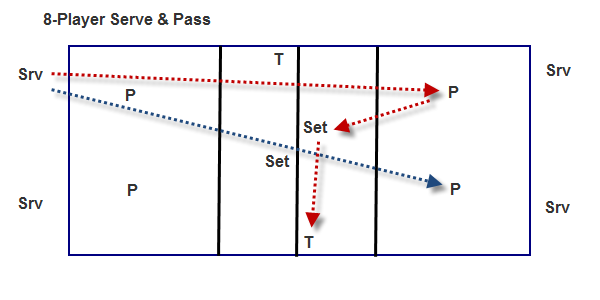 The pass goes to the setter, who then sets to the target (in either the OH or RS position). This means all four servers are going at the same time. After a given number of serves the server switches with the passer in front of them on their own side and the drill continues. After that, the servers switch to serving to the passer diagonally across from them. Depending on the number of players you have and whether you want your setters passing, you could just have targets with ball carts in the Setting position (coaches, for example). If you have 12 players the rotation could be from Server to Passer to Setter/Target to Server. Rather than going for a set number of serves, you could go for a collective number of 3-passes or cumulative passing score. This drill was run frequently by Long Beach State under Coach Brian Gimillaro. With a smaller group you can run this only in a half fashion (2 servers, 2 passers, etc.). This drill really requires lots of balls and several ball carts to be run smoothly, so it isn’t suitable for teams with smaller equipment levels. This unless you can find an efficient ball rotation system which keeps the drill moving.